"The Vermeer MX300 mixing system is an upgrade to the MX240 model," explained Tod Michael, product manager of trenchless products at Vermeer. "With the ability to use one pump with one or two tanks, the MX300 is scalable to a contractor's jobsite needs from small bores to large-diameter and longer-distance HDD applications in varying soil types." The new Vermeer mixing system can be paired with a 750 gallon (2,839.1 L) or 1,000 gallon (3,785.4 L) tank and works with a variety of horizontal directional drills. It features a wide-mouth hopper and suction hose for the convenient pouring of drilling additives. The tapered bottom of the rectangular tank design helps prevent additives from settling, building up and assists with efficient drainage. At a width of just 40 inches (101.6 centimeters), the MX300 can be mounted to transport two tanks inside a standard-sized enclosed truck. 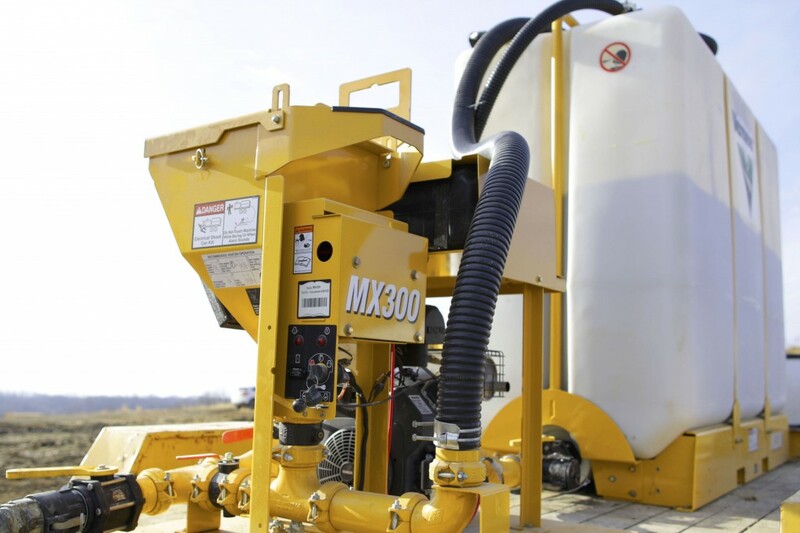 The MX300 comes with a 16 gallon (60.6 L) fuel tank and is convenient to service with access to the roll jets through the top of the tank and two drainage points that are operated by two accessible valves. Canadian horizontal directional drilling operator Fast Forward HDD could be called a specialist - more than 90 percent of the company's work hours have been spent on oil pipeline jobsites. John Hart Lake, near Campbell River on Vancouver Island, has for decades provided the people of British Columbia with electrical power and local residents with a generous source of clean, fresh water. However, an aging facility meant that BC Hydro needed to upgrade the John Hart Generating Station, which left the nearby city to rethink its drinking water source. Custom Truck One Source (Custom Truck) has entered into a strategic partnership with Hi-Vac Corporation. This partnership positions Custom Truck as an authorized dealer of Hi-Vac products in the United States. Installation of underground infrastructure has become more challenging in today's sprawling urban centres. For many types of utility and service, the need to dig under existing roads, buildings and other obstructions has brought a growing interest in horizontal directional drilling. A strong dealer support network combined with a safe and reliable product are yielding satisfied customers and increased revenue for Texas First Rentals, sister company to Holt Cat, one of the largest Caterpillar dealers in the U.S. Dumping liquid spoils from directional drilling is highly regulated, costly and time consuming. To combat these challenges, Ditch Witch, a Charles Machine Works Company, has partnered with MetaFLO Technologies to be the exclusive provider of SolidState 2 and SolidState 6 solidification reagents. This partnership will provide a more accessible and efficient process for the solidification of drilling spoils to an extended network of users and contractors. Vac-Tron Equipment is proud to announce the release of its new 6-way hydraulic boom design for its trailer vacuum excavation equipment and industrial vacuum equipment. This hydraulic boom maximizes job performance by supporting the weight of the vacuum hose. Ditch Witch, a Charles Machine Works Company, introduced its largest trencher to date, the HT275, to boost productivity and versatility on a broad range of trenching jobs. The unit was designed to increase year-over-year return on investment (ROI) on water, sewer, gas, power and underdrain installations, pipeline distribution and other heavy-duty trenching tasks. As vacuum excavators expand use beyond horizontal directional drilling (HDD) jobsites to other industrial applications such as microtrenching, operators require new technology, tools and information to be productive and safe on the job. Ditch Witch, a Charles Machine Works Company, recently introduced the Ditch Witch Certified Vacuum Excavation Training program to help both novice and experienced operators maintain performance and safety when using vacuum excavators on today's diverse jobsites. The new Vermeer MUD Hub slurry solidification system helps control the costs, time and complexity of drilling fluid management. Using the new Vermeer ST2000 slat tank and the Surface to Surface (STS) FL-243 solidification mixer, the Vermeer MUD Hub helps create stackable material for convenient transfer and disposal. For most wastewater and sanitary system cleaning jobs, it takes several minutes for sewer cleaner operators to lift additional debris tubes off the racks, maneuver the truck's boom and clamp the tubes into place - a process that can lead to operator fatigue. To improve this time-consuming process, Vactor Manufacturing introduced the Vactor RDB 1015 rapid deployment boom as an option for the company's 2100 Series combination sewer cleaners, which include the Vactor 2100i and 2100 Plus trucks. As a manufacturer of ground penetrating radar technology, GSSI is an organization that understands the rigour of field work, and their customers operate in environments that are as tough as it gets. GSSI's technology aids field work across industries, from construction sites to public utility work and even search and rescue missions following a natural disaster. Despite their reputation for industry leading software, they can't do it alone. GSSI relied on a custom controller that was hardened for field work. While it met the unique hardware requirements for their ground penetrating radar (GPR) technology, the controller couldn't keep up with the design cycle and the hardware too frequently became outdated. In a market that requires staying ahead of technological advancements, GSSI sought a new hardware partner to accompany their best-in-class software. Today's cities are busier than ever, both above and below ground. Utilities of all kinds are expanding everywhere, none more actively than the installation of fibre optic telecommunications lines. The new Ditch Witch C12X walk-behind trencher provides rental companies with exceptional return on investment while enhancing ease of use, reliability and serviceability. The C12X trencher is equipped with a compact frame, equipped with a powerful 12-hp engine and digging depths up to 24 inches. ECHO Utility Engineering and Surveying focuses on a specific aspect of Utility Engineering: Subsurface Utility Engineering. HammerHead Trenchless has released the first model of its new XPR series of high-performance pneumatic hammers for pipe ramming and pipe bursting applications. The XPR series features a newly designed high-flow valve system that produces a more powerful impact. The first model to utilize this new technology, the 26XPR, is the most powerful pneumatic hammer in its class, according to HammerHead. Trimble has introduced a new green Dialgrade laser for the installation of gravity flow pipelines: the Spectra Precision DG613G pipe laser. The Markham/Pickering area of southern Ontario, east of Toronto, has been growing steadily, and is expected to continue that growth in coming years. Greater population and the development needed to serve those increasing numbers will strain the current sanitary sewer resources. Acrow Bridge, a leading international bridge engineering and supply company, has supplied a temporary utility bridge to the City of Cambridge in Ontario for use during a project to upgrade the Hespeler wastewater treatment plant. Vac-Tron Equipment has released their new CS 1270 trailer vac. This new Compact Industrial Vac Series comes standard with a 1,200-gallon debris tank and 580 or 1,000 cfm. It is also available with a hydraulic operated opening and locking rear door, wet/dry filtration cyclone, 30' x 3" suction hose and tool, and 27 HP or 37 HP Kohler gas engine. Options include 24 HP Kohler diesel engine and reverse pressure. In December, Terex Utilities shipped a Model 330 Auger Drill to Antarctica. Designed to meet the specific needs of a science field team supported by the National Science Foundation, NSF-managed U.S. Antarctic Program, the 330 Auger Drill features a unique mounting configuration and numerous insulation and heating modifications to operate in the extreme environment. The new Auger Drill replaces a Model 330 that has been in use since 1990.